The CTSI continued to serve as a catalytic hub for translational research by leading transformative programs, providing services and resources for research teams, and offering a range of training, collaboration and engagement opportunities. The CTSI served more than 1,100 investigators in 2015. In August, the CTSI was awarded $17.5 million in renewed funding through the National Institutes of Health’s Clinical and Translational Science Award program. 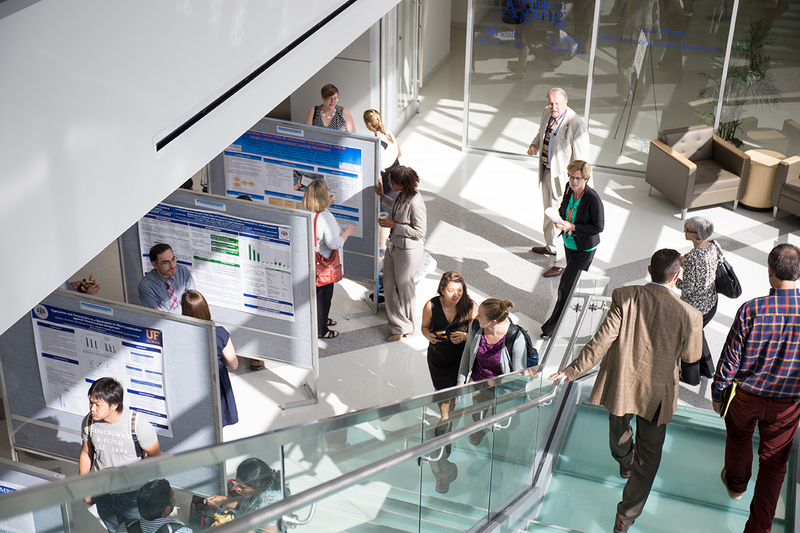 The four-year award allows the CTSI to build on UF’s strengths to chart new pathways for translational workforce development, embed translational science in health systems and physician practices, expand statewide collaborations, and accelerate the collective impact of the national CTSA network. Dr. Nelson, CTSA UL1 principal investigator and assistant vice president for research at UF, leads the new award in collaboration with Betsy A. Shenkman, Ph.D., CTSI co-director and chair of the department of health outcomes and policy in the UF College of Medicine; Thomas A. Pearson, M.D., Ph.D., M.P.H., CTSA KL2 principal investigator and executive vice president for research and education at UF Health; and Wayne McCormack, Ph.D., CTSA TL1 principal investigator and a professor in the UF College of Medicine. CTSI accomplishments reflect the dedication of hundreds of faculty, staff and students from across the university and at partners throughout the state, including Florida State University, which joined the UF CTSI as a community research partner on the NIH award. CTSI efforts to transform the research environment continued to gain momentum with an emphasis on learning health system initiatives and multisite study capacity. Precision Medicine: Developed within the CTSI and led by UF College of Pharmacy faculty, the UF Health Personalized Medicine Program continued to develop, implement, study and refine methods that allow genetic information to be used as a routine part of patient care. At the American Heart Association’s Scientific Sessions in November 2015, the program presented findings that genotype-guided antiplatelet therapy improved outcomes for percutaneous coronary intervention patients at UF Health Shands Hospital. Clinical Metabolomics: As part of the new CTSA, the CTSI’s Southeast Center for Integrated Metabolomics launched a collaboration with UF Health Pathology Laboratories to develop new diagnostic applications of metabolomics. Consent2Share: In 2015, UF Health began a phased, systemwide rollout of the CTSI’s Consent2Share program, which offers patients an opportunity to allow UF researchers to contact them about research studies for which they might be eligible based on information in their electronic health record. The program was recognized by the Association of American Medical Colleges with a 2014 Learning Health System champion award and was featured at the AAMC Learning Health System Research Awards meeting in February 2015. To date, more than 24,000 patients have agreed to participate in Consent2Share. University of Florida: In August 2015, the UF Office of Research formed a Human Subject Research Task Force to improve the effectiveness, efficiency and impact of human subject research at UF. Led by Dr. Nelson, the task force examined all aspects of human subject research at UF and is finalizing recommendations for process improvement initiatives to begin in 2016, including research infrastructure, access to participants, and regulatory requirements that are crucial to the success of multisite trials. Statewide: In 2015, the CTSI-led OneFlorida Clinical Research Consortium received a Clinical Data Research Network funding award from the Patient-Centered Outcomes Research Institute to develop the OneFlorida Data Trust and statewide research infrastructure. National: In 2015, the CTSI and 12 other CTSA hubs completed the first phase of the national CTSA Accrual to Clinical Trials project, which is creating a federated network to enable multisite cohort exploration and recruitment using i2b2/SHRINE technologies. The CTSI also joined the implementation phase of the Child Health Research Acceleration through Multisite Planning, or CHAMP, collaboration, which involves 15 CTSA hubs. The CTSI Service Center helped research teams navigate the UF research landscape, connect with potential collaborators and access CTSI services. The CTSI launched several new services in 2015, including developing a CTSI Recruitment Center and establishing new capabilities for the CTSI Investigational Drug Service located in the Clinical Research Center, which acquired a Level 2 Biosafety Cabinet to assist with preparation of gene therapy and cellular products. The CTSI continued to support ongoing pilot programs and develop new pilot programs, with three RFAs being finalized for release in the spring of 2016. In addition, the CTSI expanded its studio series to include Integrated Data Repository studios as well as “on-the-road” Implementation Science Studios for clinicians. Education: The CTSI Translational Workforce Development Program expanded its role as a hub for translational science training at UF Health, including the launch of a new “K College” and “T Team” to support and convene K and T scholars across colleges. In 2015, the CTSI welcomed approximately 15 new scholars across its KL2, TL1 and TRACTS programs, as well as 16 new members of the CTSI Mentor Academy. New academic programs launched in the fall include an Educational Scholarship Program and a graduate certificate in biomedical informatics. In addition, the Center of Excellence for Regenerative Health Biotechnology joined the CTSI TWD Program. Collaboration: The CTSI launched a Network Science Program to study and guide the maturation and integration of the UF CTSI and larger CTSA scientific collaboration networks. Led by faculty in the College of Liberal Arts and Sciences, the program will build on existing research to enhance team science and multidisciplinary collaboration at UF and nationally. Engagement: The CTSI Implementation Science Program created training materials for its Citizen Scientist Program, which recruited, hired and provided training and support to enable 12 patients and community members to serve as collaborators throughout the research process. The CTSI’s HealthStreet program further developed the Our Community, Our Health series into a national multisite forum that uses livestreaming, text messaging and social media to engage researchers and community members in open dialogue. In addition, HealthStreet received two grants to extend its community health worker outreach beyond Alachua and Duval counties.